An organic farm-fresh vegetable subscription that will help you get better quality, change the way you eat, and grow your family's excitement about vegetables. When are the tomatoes coming? Ever wish you knew when certain veggies were in season? Our PDF calendar grid shows you Farmer Gene's harvest plan for packing this year's CSA boxes. If you want to roughly know what to expect in each week's CSA box or which veggies we plan to grow (and when), this chart is for you! Subscribe below to download the calendar! "Better health awaits you with your very first box - try it out!" You want to eat more vegetables and try new things. We’ll help you do it. Our Certified Organic veggies are picked fresh for you and taste delicious. We grow everything with care right on our local family farm. What makes Ripley Farm so different? When it comes to putting food on the table, many people are so uninspired by grocery store produce that they don't know where to start. 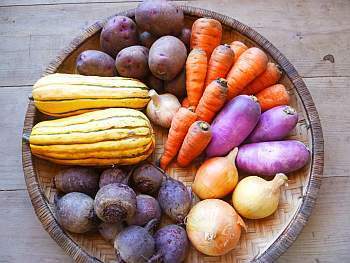 The Ripley Farm CSA vegetable subscription program helps local families get delicious vegetables and prepare them so that they love every bite. We know how hard it is to eat healthy and have helped hundreds of local couples and families transform their vegetable consumption. When you have tasty, colorful vegetables in your fridge waiting to be used, you find ways to incorporate more of them into your diet, your family is converted into “seconds-please” veggie lovers, and your satisfaction in the kitchen grows. 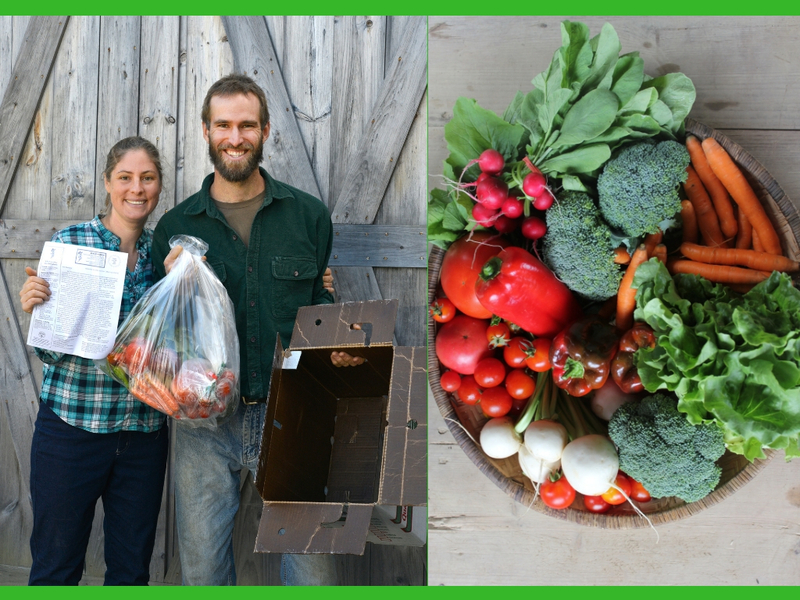 The Ripley Farm CSA vegetable subscription program is run by farmers Gene and Mary Margaret Ripley. We have cooked with farm fresh organic vegetables for over a decade and are versatile with this staple of healthy diets. We now enjoy completely skipping the grocery store produce aisle. We have helped hundreds of local families enjoy nutritious vegetables raised on our organic farm. And we walk right along side our subscribers, learning and sharing new things all the time. Our online ‘Vegetable Gallery’ contains hundreds of simple, yet interesting recipes that are hand-collected, tried-and-loved from our farm kitchen. Our subscribers dramatically increase their vegetable consumption and satisfaction after learning the Ripley Farm “CSA way” of eating. Get a popular healthy eating solution that is used by thousands of households every year. You will experience how CSA works and why fresh, local, organic variety has always been the key to health. Learn the strategies our vegetable subscription program ‘CSA Experts’ use to succeed in the kitchen and at the dinner table. Use this information to incorporate delicious vegetables into your meal plans and food preparation routine. Ripley Farm will help you create vegetable-rich meals everyone will love. People like food that tastes good. If vegetables don’t taste good, then people will gravitate towards other foods. Once you discover delicious vegetables and gain the knowledge of what to do with them, your family’s diet will begin to change. Families who have mastered the “CSA way” eat more vegetables and love every bite. Sign up today for Ripley Farm’s vegetable subscription program and spend the season with Gene and Mary Margaret. Why? Because your family will not know how much they love vegetables until you serve them the right stuff. Tell us you are ready for more and better vegetables. We’ll get growing. 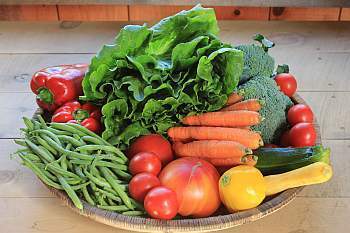 Pick up a weekly variety of vegetables hand selected by your farmers. You don't have to be a fancy chef to prepare delicious food everyone will love. "We love our CSA from Ripley Farm because... we know the quality and nutritional value are A+++!" "Many times there are new things that we may not have tried before but the newsletter has suggestions for use and it has expanded our diet greatly. We now have new favorite veggies because of the CSA." "I have learned so much about what I eat and I am happy to be a part of Ripley Farms!!" "The boxes are always filled with fresh, delicious veggies and great recipe ideas to try for the whole family." "After 80 healthy and happy years of enjoying my own home grown veggies, I'm now supplementing my smaller garden with Ripley Organic Farm's large variety of highest quality veggies." …and the element of surprise in eating seasonally! We are sold out of shares for 2019! Learn more about this popular program here! Registration for the upcoming 2019-20 Winter CSA will open in August 2019. Click below to be the first to find out when. "I'm always excited to see what I have in my box each week. It's kinda like Christmas. Every time I eat a raw carrot, I think how much sweeter these are than any others I have ever had. I just love them..."
"Christmas comes once a week for us from July through mid October thanks to our CSA with Ripley Farm." "It's easy to feel enthusiastic about your food when your farmers are interacting with you weekly." "Participating in Ripley Farm’s CSA program fulfills our mission to support local, sustainable agriculture and to eat an organic vegan diet." "We started as a way to support our goal of eating healthier and also trying new and different fresh veggies. Guess what, we learned there's a lot we didn't know about and now love!" Experience vegetables that taste great.